Time for Part 2 of my Resolution Run! 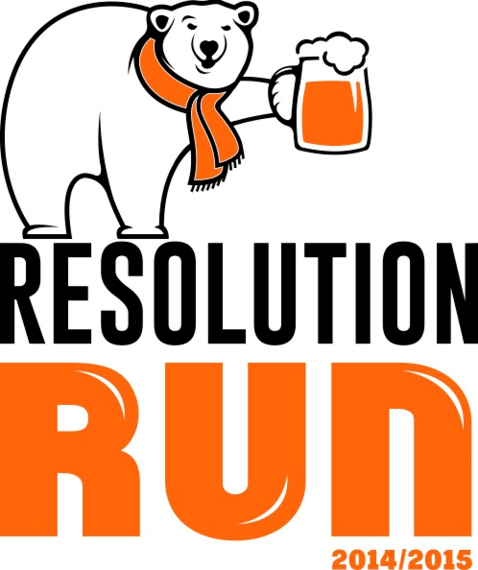 As you may remember, back in September my husband and I signed up to do a 5k run on December 31, 2014 call the Resolution Run. 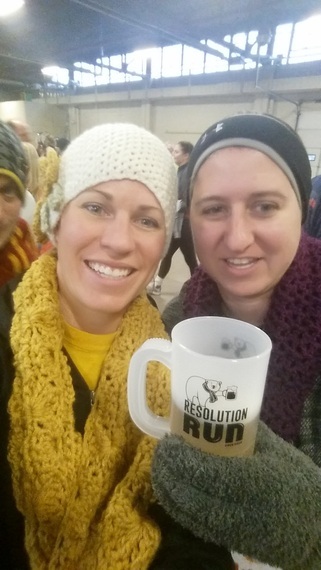 It is a beer run that is done every year on New Years Eve. The last 3 months of training for this race did NOT go as planned. Brian, in an attempt to start running, did too much and strained his knee. That put him out of even walking for a couple of weeks. And me being lazy wouldn't walk without him. I did start walking a bit more at work but that only lasted until it got cold out. After that I couldn't be bothered. Plus who likes losing half of their lunch break let alone to go out into the cold? That and the holiday's put my weight back up a bit but only a bit. I am not a good selfie taker, I'm not one of those kids who grew up with a camera phone in hand and just never really got the hang of it. 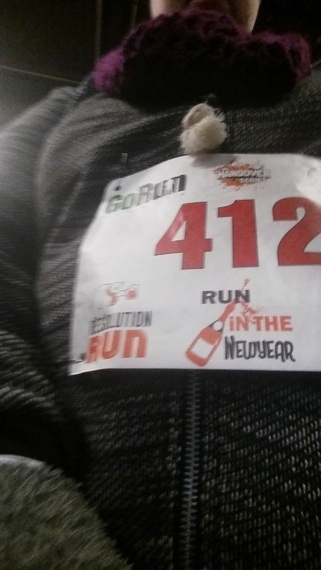 This is of course me in my bib. On the back side is a tracker that starts and stops your time in their system as well as a GPS chip. Of course the GPS isn't important for a 5k so much but those doing the half marathon the next day would be using the same bibs and it is important for those long runs. My sister and me, I'm the one with the goofy look on my face. Remember I said I don't take selfies very well. The mug of course has beer in it as this was a beer run. There was a keg in the room where we gathered before the start so anyone who wanted to could start drinking early. I had half a mug. There were also 3 stops along the run where people could stop and have another beer. Brian and I did not stop, neither of us really wanted the beer and it would have just slowed our time down. I did have another beer after we finished. We finished the race in 56 minutes. That was a big deal for us. Most people finished in around 30 minutes, even those who stopped to drink. The fastest people finished in 16 minutes. I was just so happy to have finished in under and hour. We did walk most of the way but managed a bit of jogging here and there, especially when going down hill. I nearly cried when we crossed the finish line as I was so happy to be done and to have completed it fully. The medal there is very nice. Made of metal of some sort and rather heavy. 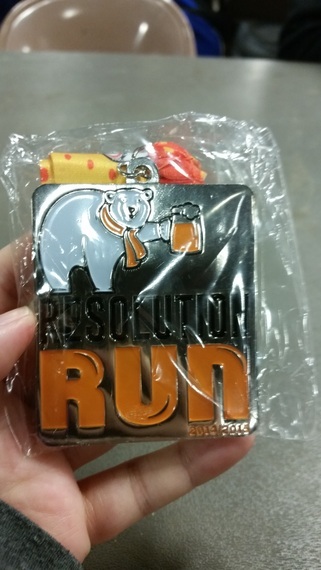 I nice souvenir of my first 5k! 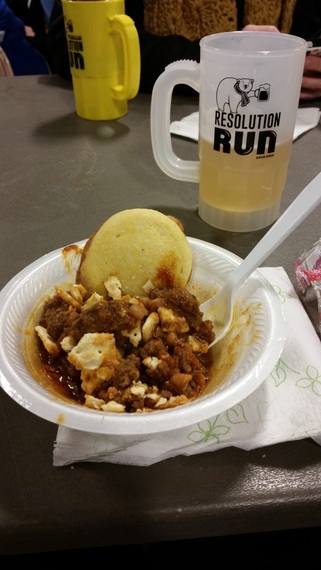 After the race we were treated to a bowl of chili which I devoured along with a beer. I was so hungry. That biscuit you see there is corn bread and it was very good. Over all I am very proud of how well we did and the fact that we went through with it and completed it even though we really weren't ready for it. It gives me encouragement to sign up for another one this spring and to try and do better. You did really well. I'm having my foot operation sometime in July and hopefully I will be able to walk further or maybe even run, who knows. Then I might do a 5k walk/run later in the year. After training that is. If you chose to not log in to post a comment please at least leave a name in the name field. Thank you! and we fell in Mutual Weirdness. and watch too much Netflix. I've been overweight for a long time. I've finally found motivation to do something about it. June 2015 my family is going on a cruise together. By then I want to at least be down 65lbs (weight of 250) so that I'll be able to enjoy it more. That is my motivation and my first major goal. My first minor goal is to run a 5k in December of 2014.